Big Trouble is a 2002 American gangster comedy film based on the novel Big Trouble by Dave Barry. It was directed by Barry Sonnenfeld and featured a large cast including Tim Allen, Rene Russo, Dennis Farina, Zooey Deschanel, Sofia Vergara and Jason Lee. Like much of Dave Barry's fiction, it follows a diverse group of people through a series of extremely strange and humorous situations against the backdrop of Miami. In a high-school game of "Killer" (in which a student must shoot another with a squirt gun), Matt Arnold has to "kill" classmate Jenny Herk, and decides to sneak up on her at home. By coincidence, hitmen are also there to assassinate Arthur Herk, who has secretly embezzled money from his company, Penultra Corp. When the fake assassination attempt crosses paths with the real one, police officers Monica Romero and Walter Kramitz are called out to the resulting disturbance. During the chaos of the assassination attempts, Matt's friend, Andrew, called Eliot Arnold, Matt's father. Upon arriving to pick up Matt from the Herks', Eliot immediately feels a mutual attraction to Anne Herk, Jenny's mother, as Matt and Jenny begin to feel attracted to each other as well. The Herks' housemaid, Nina, meanwhile, falls in love with a young homeless man named Puggy, who lives in a tree on their property, after she runs from the shootings and he saves her from the hitmen. Realizing that he is the intended victim, Arthur visits arms dealers to buy a rocket but is sold a suitcase nuclear bomb because the dealer claims to be out of rockets and doesn't tell him that it is a nuclear weapon. Escaped convicts Snake and Eddie, who were previously kicked out of the bar for disorderly conduct, hold up the bar and kidnap Arthur and Puggy (who is an employee there) and take the suitcase, not knowing its contents. Meanwhile, Matt tries to "kill" Jenny in a mall parking lot, but a security guard thinks that Matt's gun is real and opens fire on them. Matt and Jenny run away and eventually return to the Herk house, followed by officers Monica and Walter, who stumble across the confusion. Eliot is called over once again. The convicts force Arthur to return to his home, where they capture everyone and tie them up. Taking Puggy and kidnapping Jenny, they leave (with the suitcase) for the Airport. Nina, who was hiding in her room, frees everyone except for Monica and Arthur (who were handcuffed to an entertainment system). Shortly after, the house is visited by two FBI agents who are tracking the bomb. They free Monica and have her lead them to the airport (leaving Arthur, as he was poisoned by a hallucinogenic toad, causing him to think that his dog is possessed by Martha Stewart). The criminals pass through security with Puggy and Jenny, where the bomb is inadvertently triggered and its 45-minute timer begins; Puggy manages to escape in the confusion of boarding the plane. The FBI agents tell everyone that unless the bomb is retrieved soon, the plane must be shot down. Puggy leads the group to the criminals' plane, which Eliot sneaks onto. Meanwhile, the two hitmen get out of the traffic jam (caused by Snake and Eddie) and reach the airport. They bump into Officer Romero, and Special Agents Greer and Seitz, knocking the hitmen's Remington sniper rifle out of their golf bag in the process. Romero grabs the rifle, removes its bolt (rendering it useless), and returns it. Eliot, having sneaked onto the plane, attacks the criminals by knocking Eddie out with a fire extinguisher and blasting the extinguisher at Snake. On hearing the case is a bomb, Eliot hurls it out of the still open rear door, only for Snake to leap after it. In a memorable feat of dumb luck, Snake manages to cling onto the door's steps. Despite Eliot's insistence that the case is a bomb, Snake opens fire on him which prompts Eliot to pull the emergency lever which decouples the door. Snake plunges into the ocean with a defiant smile, still clinging to the bomb, which explodes safely in the water. Eliot is congratulated by the FBI, promised he will receive presidential cowboy boots and a hat, and told the events that took place are strictly top secret. The last scene reveals what happens to the main characters: after chasing down a plane, subduing two criminals, and saving Miami from a nuclear disaster, Eliot finally won Matt's respect. Anne and Eliot get married a week after Anne gets divorced from Arthur. Walter, after a forced strip search by the airport guards, becomes a male stripper and marries. The two hitmen manage to escape Miami after a series of very weird events. They claim their Miami job was the lowest point in their careers. They were surrounded by the fans of Florida Gators on their plane home (which was a constant joke in the film). Eddie goes back to jail in a prison outside of Jacksonville, but becomes friends with another dimwitted inmate who shares the same affinity for crude jokes as Eddie does. Arthur is last seen still handcuffed and tormented by his dog. Tim Allen as Eliot Arnold – A divorced man, fired from his job at the Miami Herald and running a struggling advertising agency. His teenage son Matt thinks he is a dork. Rene Russo as Anna Herk – Jenny's devoted mother and the reluctant wife of Arthur (even though she thinks he's an idiot). She becomes immediately attracted to Eliot upon meeting him. Stanley Tucci as Arthur Herk – A rude and obnoxious man marked for death for embezzling from his company. Ben Foster as Matt Arnold – Eliot's son and the "killer" of Jenny. He also develops a crush on her. Zooey Deschanel as Jenny Herk – Anna's daughter and a classmate of Matt. She is also Matt's target in the school's game "Killer". Tom Sizemore and Johnny Knoxville as Snake Dupree and Eddie Leadbetter – Two bumbling ex-convicts. Dennis Farina and Jack Kehler as Henry Desalvo and Leonard Ferroni – Two hitmen hired to kill Arthur for embezzling. Janeane Garofalo as Officer Monica Romero – A competent police officer. Patrick Warburton as Officer Walter Kramitz – Monica's incompetent fellow officer. Asks his partner Romero out on dates even though he's married. Heavy D and Omar Epps as Special Agents Pat Greer and Alan Seitz – Two FBI agents determined to retrieve a missing nuclear bomb. Jason Lee as Puggy – A homeless wanderer who loves Fritos and Nina. Sofía Vergara as Nina – The Herks' teenaged Mexican housemaid. She falls in love with Puggy, who she initially mistook for Jesus. Michael McShane as Bruce – The consumer from hell who constantly belittles Eliot's advertisement ideas for his products. He suffers several indignities at the hands of other characters during the movie. DJ Qualls as Andrew Ryan – Matt's school friend and witness for when Matt "kills" Jenny. Big Trouble was originally scheduled for release on September 21, 2001, and had a strong advertising push. The September 11, 2001, attacks of that year made the film's comedic smuggling of a nuclear device onto an airplane unpalatable. Consequently, the film was pushed back until April 2002, and the promotion campaign was toned down almost to the point of abandonment. 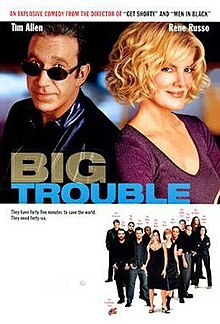 Big Trouble came quietly to American theaters and left quickly afterwards, receiving mixed reviews and being generally ignored by audiences, becoming a box office bomb. It holds a 48% rating on Rotten Tomatoes, based on 112 reviews, with the consensus reading "With its large cast and frantic comic pacing, Big Trouble labors for slapstick-style hilarity, but it never really gains steam." In the book, Matthew Arnold, as well as female police officer Monica Ramirez, actually board the plane to rescue Jenny Herk. In the film, Monica Romero never boards the plane. The ending of the book was drastically different, with Walter being left handcuffed with Arthur, Henry and Leonard fighting off an escaped pet python at the airport, and a third police officer helping the FBI agents find the bomb. In the film, when Arthur is squirted with hallucinogens he believes his dog is Martha Stewart (who actually performs the cameo). In the novel, it is Elizabeth Dole. ^ a b "Big Trouble (2002)". Box Office Mojo. Retrieved 29 July 2011. ^ "Big Trouble (2002)". Rotten Tomatoes. Retrieved 18 March 2019. ^ Dave Barry (28 April 2002). "For a Hollywood premiere, you have to choose the dark blob that's the most flattering to you". The Baltimore Sun. Retrieved 23 April 2014.